The Construction (Design and Management) Regulations 2015 ("CDM Regulations 2015") affect almost all construction projects in Great Britain and so all consultants need to ensure they are familiar with them. They have now been fully in force for a few months (since 6 October 2015) but the industry is still adjusting to the changes brought about by them and there remains some uncertainty as to their practical application to construction projects, as shown by a number of common queries which we have been asked. 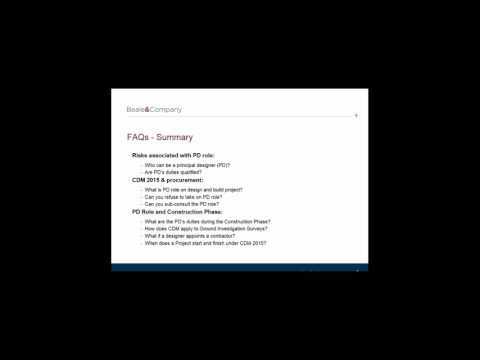 Our webinar answers some of these FAQs on the new regulations and also updates you on the latest developments including whether or not an ACOP will be issued for CDM Regulations 2015 and possible amendments to aid house builders. Please click here for a copy of the webinar slides. To view a recording of the webinar, please click on the video link below.